Be the first to share your favorite memory, photo or story of Elbert. This memorial page is dedicated for family, friends and future generations to celebrate the life of their loved one. Mr. Elbert Lee Whitley, age 90, of Centre, AL passed away Tuesday, January 22, 2019. He was born in Columbus, GA on September 3, 1928, a son of the late Charles Lee Whitley and the late Lottie Mae Nix Whitley. Mr. Whitley spent his childhood in Troup County. He moved to Marietta, GA in 1961 where he made his home until moving to Centre, AL in 1998. While living in Marietta, he was owner/operator of Discount Lumber Company. He relocated his business to Centre, AL where he was involved until his health declined at the age of 90. Mr. Whitley was a member of River of Life Church of God in Woodstock, GA. In addition to his parents he was preceded in death by two brothers: C.L. Whitley and David Whitley; and two sisters: Gladys Brown and Emma Bailey. Survivors include his wife of seventy one years, Annette Fincher Whitley, Centre, AL, to whom he was married on March 29, 1947; son, Ronald "Bo" Whitley, Leesburg, AL; two daughters: Judith Anne Whitley, Centre, AL and Brenda Holcomb and her husband Larry, Marietta, GA; six grandchildren; five great grandchildren; one great great grandson; two brothers: Earnest Whitley and Bob Whitley; two sisters: Alberta Hamilton and Louise Clark; a number of nieces and nephews also survive. Funeral services will be held Saturday, January 26, 2019 at 12 noon EST in the chapel of the Alvis Miller & Son Funeral Home with Pastor John Brooks officiating. Interment will follow in the Howell Cemetery of Trion, GA.
Pallbearers will include: Rodney Triplett, Phillip Proctor, Tyler Whitley and John Robert Brooks. The family will receive friends on Saturday from 10:00 am EST until the funeral hour at the Alvis Miller & Son Funeral Home. The family will also have a Celebration of Life Service on Sunday, January 27, 2019 at 11:00 am EST at the River of Life Church of God in Woodstock, GA. In lieu of flowers memorial donations may be made to the River of Life Church of God in memory of Mr. Whitley. 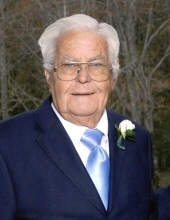 The Alvis Miller & Son Funeral Home is in charge of arrangements for Mr. Elbert Lee Whitley. To send flowers or a remembrance gift to the family of Elbert Lee Whitley, please visit our Tribute Store. "Email Address" would like to share the life celebration of Elbert Lee Whitley. Click on the "link" to go to share a favorite memory or leave a condolence message for the family.